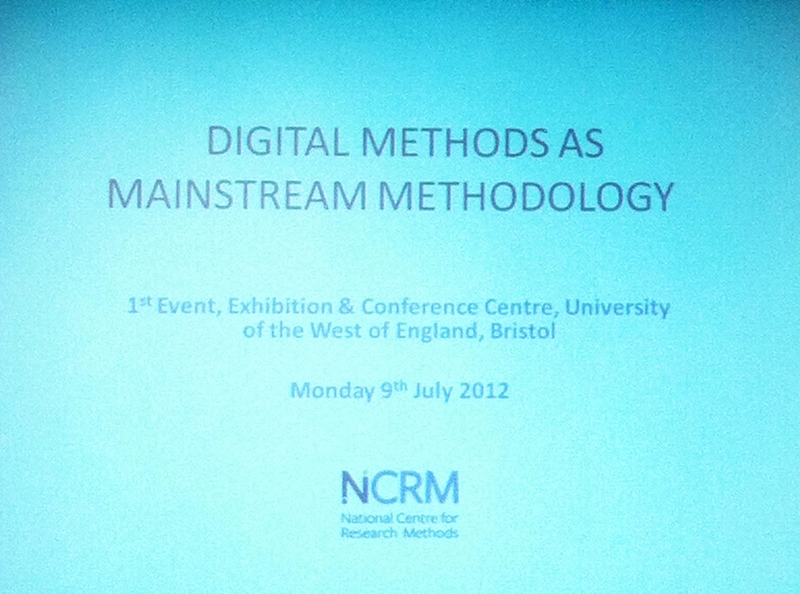 The first in the Digital Methods as Mainstream Methodology seminar series was held on 9th July at the University of the West of England in Bristol. Speakers at the event were Axel Bruns of the Queensland University of Technology, talking about mapping online publics; Eric Meyer from the Oxford Internet Institute, University of Oxford, discussing how technological innovations are shaped by disciplines to transform research; and Christine Hine from the University of Surrey, exploring the internet in ethnographies of the everyday. If you missed the event and would like to find out what was discussed, video interviews with the speakers are being uploaded on our YouTube channel. We also have a Storify of conversations around the day, including Twitter coverage (you can also search on Twitter for the hashtag #DMMM1). This entry was posted in blog and tagged Axel Bruns, Christine Hine, Digital Methods as Mainstream Methodology, Eric Meyer, ethnography, innovation, internet, mapping, NCRM, Oxford Internet Institute, publics, Queensland University of Technology, research, Storify, technology, Twitter, University of Surrey, University of the West of England, YouTube. Bookmark the permalink.